The struggle against revisionism in Marxism, at the light of the Chinese question, concentrates one of the central combats of Marxism and is where the continuity of its program in the battles of the 21st Century is forged against its revisionist liquidators who "invent new theories" to justify their betrayals to the proletariat and prepare their next defeats. 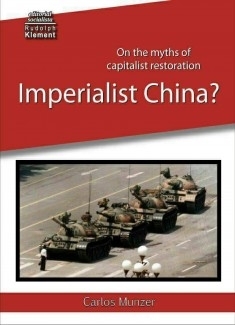 The revisionists who weil the ghost of a "Chinese imperialism" - one of the myths of capitalist restoration - want to convince the world proletariat that capitalism in its imperialist epoch of decay and rottening, of parasitism and reaction all along the line, can develop "new imperialist powers" in a peaceful way, without the collapse of other powers through wars, as defined by revolutionary Marxism. They want to deceive the world working class by saying that the counterrevolutionary capitalist restoration in China, a terrible defeat to the world proletariat carried out by the Maoist bureaucracy, played a progressive role in history. They review the Marxist theory, saying that with "socialism in one country" and under the leadership of the counterrevolutionary gang of the Maoist bureaucracy, the productive forces could be developed in China and today it can become "a rising imperialism". This revisionism aims to feed the chauvinist propaganda towards the American proletariat by US imperialism in its race for the re-colonization of China. These falsifications of Marxist theory have already been defeated by revolutionary Marxism since the founding of the Third International of Lenin and Trotsky. Today's revisionism does not say anything new. They are followers of their teachers Kautzky, Bernstein, Stalin, the Pabloites and their descendants today that for 70 years have tried to liquidate from whithin the theory and program of the Fourth International of 1938.